Co-captain Jack Hellier accepts the inaugural AFL Chairman's Cup after his Magpies recorded a 42-point win over the AIS-AFL Academy at the MCG on Friday evening. Photo: Shane Barrie. It's only March and the match wasn't for four points, but silverware is silverware no matter which way you spin in. And when it's won by a VFL team made up of several youngsters from the TAC Cup and local leagues around Victoria on the MCG in the curtain raiser to the annual Carlton v Richmond grudge match, it's that bit sweeter. In winning the inaugural AFL Chairman's Cup, Collingwood's VFL team managed to record its first win of the pre-season and pump some vital match fitness into the legs of star duo Dale Thomas and Andrew Krakouer. Collingwood overcame a talented AIS-AFL Academy team 15.15 (105) to 9.9 (63) in its final practice match of the month. It will open its home and away campaign against North Ballarat at Victoria Park next Saturday. 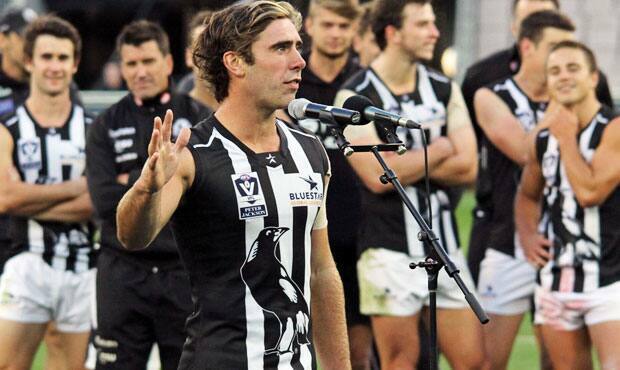 Collingwood's VFL list was announced on 2013. You can learn more about our VFL players here. After a slow start that saw them concede four goals to one in the opening quarter, the Magpies put the foot down in the second stanza as they piled on seven goals to nil and effectively put the kibosh on the game as a contest. VFL coach Dale Tapping said that the match was an important opportunity for his side to fine tune its on-field set ups against talented opposition before the real thing begins next week. "We obviously had a couple of experienced boys in today but really our approach to the game wasn't just about today, it was about trying to set up behaviours and formulas that are going to stand us in good stead for the season," Tapping told collingwoodfc.com.au from the old changerooms underneath the Great Southern Stand. "It just wasn't about this game, this is just part of the long-term process. That was the way we coached it." Although the AIS got the jump on his players in the opening quarter, the work rate of players such as Kyle Martin, Adam Oxley, Jack Hellier and Ben Hudson to name but a few helped kickstart Collingwood's charge in the second quarter. "They certainly got us a little bit on the hop but I thought after quarter time we sorted ourselves out and played the way that we want to play our footy in terms of our method, which is not over complicated believe me, but sometimes for whatever reason it doesn't work. "But I thought after quarter time, right until the end of the game our attack on the footy and the contest was where it should be and there were signs of how we want to play and the method we want to use with our ball movement was there. That was positive so we take a bit out of it. "We had 30-odd scoring shots, the ball was a bit greasy, we won the ball around the middle of the ground, our use of the ball at the stoppages and spread was good. There were some real positives after quarter time in terms of how we want to play our footy. We'll just keep trying to have a crack and trying to get better with that." Martin was by far the standout player on the ground. The 22-year-old rookie has hit the ground running ever since he arrived from VFL rival Frankston in December and on Thursday he thrust his name in front of the match committee's eyes with a 35-possession, nine mark performance. Importantly for Martin, Tapping was pleased that he performed well in the areas he and the coaching staff had outlined pre-game. "Marto was good. I thought Marto was really good. He was good in the areas he needed to be good at for AFL footy. "We're really happy with the way he stuck at it. He's going to be a good player at VFL level. He's just got to find that extra 10 per cent for the next level. That's what he's got to do." As for the two big names to pull on the VFL jumper, Tapping had nothing but praise for their attitudes and determination to extract exactly what they needed from the outing. "Daisy played 75 per cent and was really good. He was great with the group. He trained with the VFL boys last night in our final session and really set the session up with his enthusiasm and today he was good. "He kicked a good goal when he went forward, helped organise the players on the ground and attacked it as we know he can. He ran the game out really strongly and got out of the game what he needed. He's a star player and a quality player of the competition. It was great for him. Recap Collingwood's live coverage of the match here. "He was excellent amongst our group in sharing his knowledge and experience. That's what we want all our AFL guys to do when they come back. If we're getting that sort of output from our boys coming back it's only going to help our VFL team." And as for the man Brian Taylor calls the MCG specialist? "Krak was excellent. He covered the ground really well which was good. He ran it out really well, similar to Daisy in that he played 75 per cent. "Got his hands on the ball and was dangerous around goal as we know he can be. He would have taken a lot out of the game particularly from a conditioning perspective. "I suppose Bucks will sort out what he needs to do with him but it was good seeing him back playing, to be honest. That'll unfold. He might need a few more weeks in terms of getting his match fitness up but that will sort itself out. I think once he's fit he'll press pretty strongly for selection." Of the other AFL-listed players, Adam Oxley was clean every time he went near the ball, Ben Hudson was a force at the stoppages around the ground, Caolan Mooney created several opportunities in attack and young midfielder Ben Kennedy got his hands dirty beneath the packs in the centre. The only downside for the Magpies was the shoulder injury suffered by Lachlan Wallace who collided with Luke Reynolds on the Great Southern Stand wing late in the match. Co-captains Nick Riddle and Jack Hellier and coach Dale Tapping pose with the AFL Chairman's Cup in the Great Southern Stand changerooms after the match. Photo: Shane Barrie.